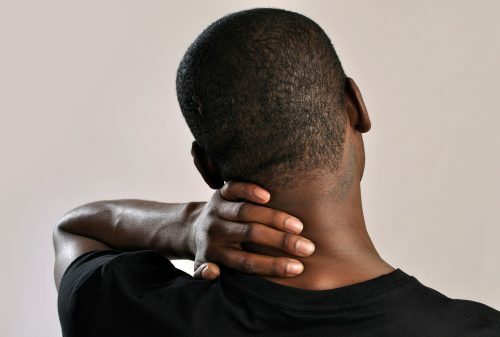 A headache in the back of the head can be a nuisance, disrupting your day and sometimes preventing you from carrying out normal activities, but what causes these pains? Continue reading to learn about headache trigger points, as well as some of the most common causes of headaches in the back of the head and some tips on how to treat and avoid these annoyances. Headache trigger points are locations within groups of muscles that can cause tension headaches when stressed. The muscle groups affected are the splenius muscles, the sub occipitals, the sternocleidomastoid, and the trapezius, and tension along each can result in a headache. Splenius muscles run from the upper back to the base of the skull and the upper cervical vertebrae, and if the trigger points are activated, they can cause headaches that move through the head to the back of the eye and top of the head. The suboccipital muscle group consists of four small muscles that maintain proper movement and position between the first cervical vertebra and the base of the skull. These trigger points create a pain that feels as though it is inside the head and extends from the back of the head to the eyes and forehead. The sternocleidomastoid muscle runs from the base of the skull behind the ear down to the top of the sternum, and when triggered, this muscle can cause pain felt deep in the eye and over the eye, as well as dizziness, nausea, and difficulty balancing. The trapezius muscle runs through the mid and upper back and has a trigger point located at the top of the muscle. It can cause pain in the temples and back of the head, as well as the jaw. Many headache triggers can be avoided if you are able to identify them. Managing stress can reduce tension headaches, as well as altering your diet to avoid high sodium foods, artificial sweeteners, and MSG. Keeping a headache diary that details when the pain begins and what you have consumed that day, as well as factors like your workload, can help you track your headaches and identify potential triggers. Once you understand what causes your headaches, you can begin to actively avoid these factors and reduce the number and severity of headaches you experience. A headache in the back of the head may occur for a number of reasons, from environmental factors to other medical conditions. Below is a list of the most common causes. Cervicogenic headaches: These headaches are felt at the back of the head on only one side and are usually due to a previous injury like whiplash or a concussion. Giant cell arteritis: The occipital arteries are found right next to the occipital nerves, and when these arteries swell as a result of giant cell arteritis, it can put pressure on these nerves and cause headaches. High-altitude headache: Some mountain climbers experience headaches in the back of their heads while at high altitudes, and they are sometimes exacerbated by physical exertion. Coughs: Headaches in the back of the head may be caused by coughing that jars stiff muscles and joints to trigger head pain. Dialysis: Some people who undergo dialysis regularly can experience headaches in the back of the head caused by having high blood pressure before the treatment. Heart attack: Pain in the back of the head may occur during a heart attack or at the onset of an angina attack. Trapped nerves: Sharp pains in the back of the head and neck can be caused by a trapped nerve. Conditions like occipital condyle syndrome, hypoglossal nerve palsy, and accessory nerve palsy can cause headaches driven by damage to various nerves. Chiari malformation: Chiari malformation occurs when brain tissue extends into the spinal canal due to a misshapen or too small skull that presses on the brain and forces it down. This can cause pain in the back of the head that is worsened with coughing, laughing, sneezing, and physical exertion. Parkinson’s disease: Some people with Parkinson’s may experience “coat-hanger pain” in the back of the head due to low blood pressure. Dengue fever: A prominent and severe headache is a hallmark of dengue fever, with approximately one in five of these headaches occurring in the back of the head. Headaches in the back of the head can be caused by a range of factors, from muscle tension and certain foods to stress and even existing medical conditions. Tracking your headaches and the factors that seem to cause them can help you reduce the frequency and severity with which they occur, however, if you are concerned about the pain you are experiencing, it is always best to seek the advice of a medical professional.